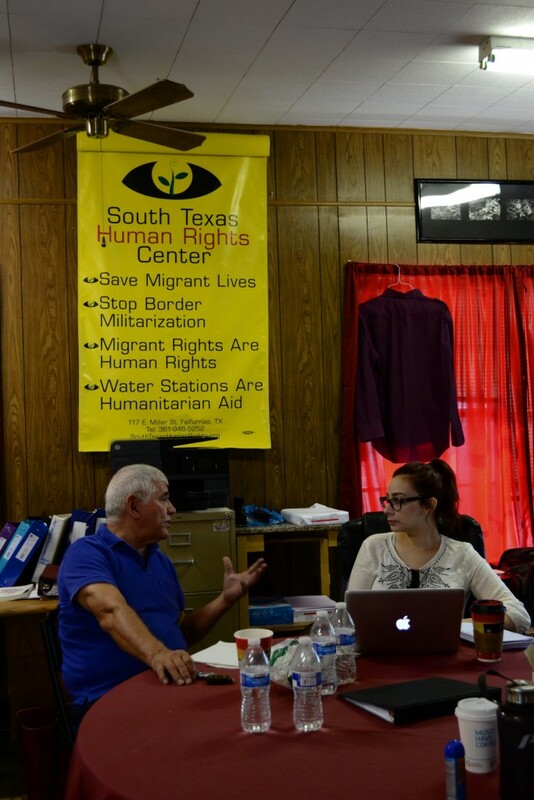 We’ve spent this week at the South Texas Human Rights Center (STHRC), and so I thought I would post a few pictures of what the center is like. The hub of all activity regarding this crisis in Falfurrias is situated in a tiny, yet cozy building right across the street from the Brooks County Courthouse. The main room contains a few desks with computers and papers, a central table and chairs, and is decorated by an assortment of posters, religious items, and colorful trinkets. Behind the main room is a small backroom that mainly contains water and donated supplies. Finally, the backdoor of the center leads to a small storage area containing buckets and poles used for making water stations. 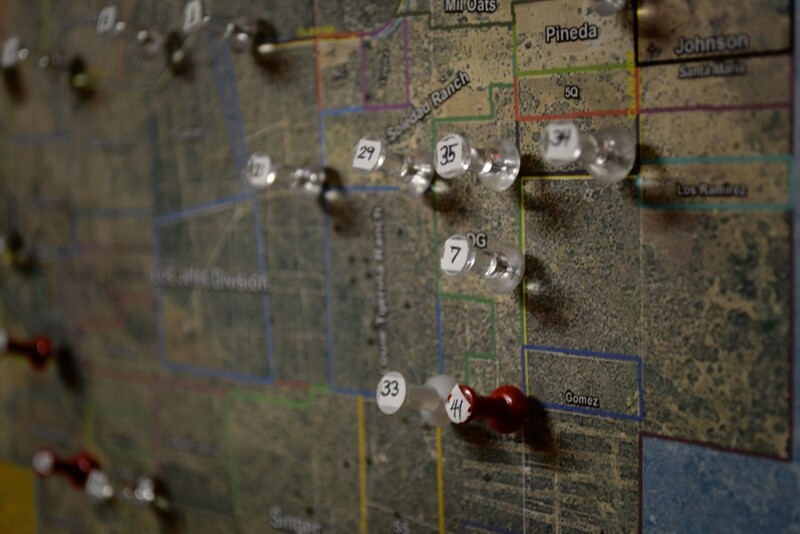 A map is used to keep track of all the water stations in Brooks County . Sister Pam makes sure all stations are checked, repaired and refilled every week. Stacks of water jugs sit in the front of the room, waiting to be placed in the truck during a water station refilling run. 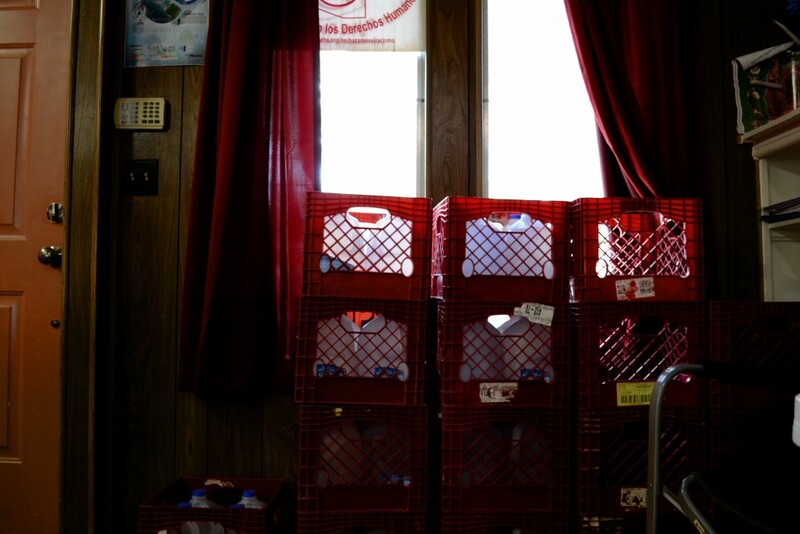 Water is donated by multiple organizations and people around the community. 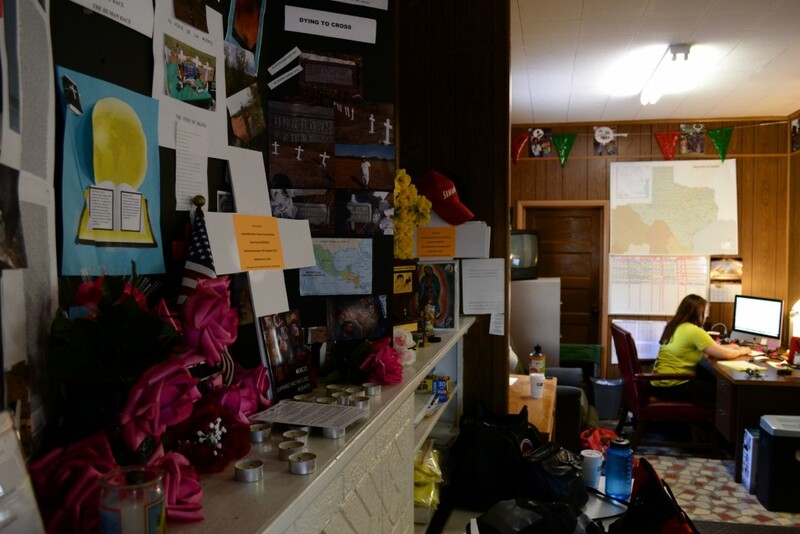 The colorful center is incredibly decorated by various signs and posters that generally symbolize hope and respect for migrants and their families. Many of these posters have at one time been used to bring awareness to the humanitarian crisis. Others are donations. Eddie and Priscilla discuss upcoming strategies. Priscilla, an intern from the University of Pittsburgh, is often busy making phone calls to families of the missing in hopes of obtaining as much information as possible that could aid in finding their loved one. Eddie, the director of the center, continually offers advice and support for interns and volunteers. His passion for the human rights center’s work is unrelenting. Eddie and Sister Pam discuss recent the good news of obtaining additional missing persons reports. Sister Pam works tirelessly, approaching the crisis from every direction possible. The only time she isn’t smiling is when she is concentrating very hard. Her smile brings a positive aura to the center that resonates as bright as the colorful decorations that don the walls. 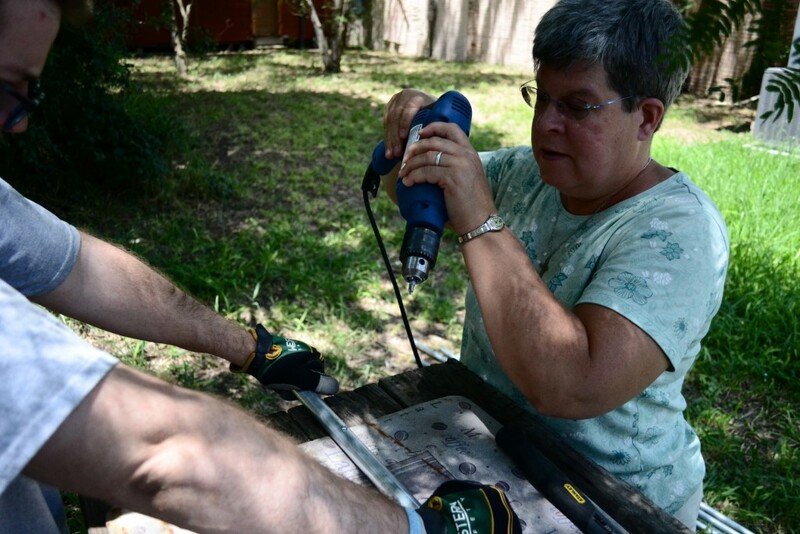 Sister Pam teaches Justin how to build flag poles used for water stations. No job scares Sister Pam. From climbing over ranch fences to repair water stations to carrying giant buckets, Sister Pam constantly leads and inspires those around her and working with her. 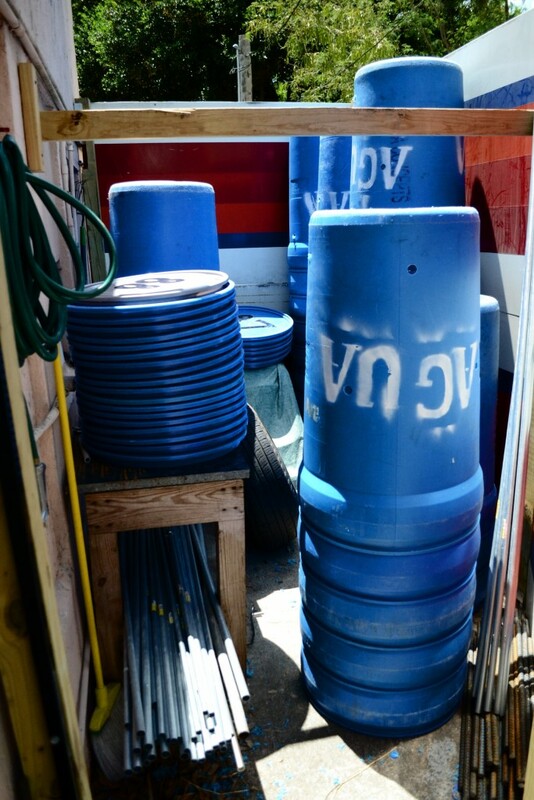 Water buckets and DIY flag poles are stored behind the center. Sister Pam and the human rights center currently has around 70 water stations available around Brooks County for migrants to use if needed. Their goal is 100 as soon as possible. This cozy center has been our home this past week, but can be home to anyone who would like to volunteer their time. 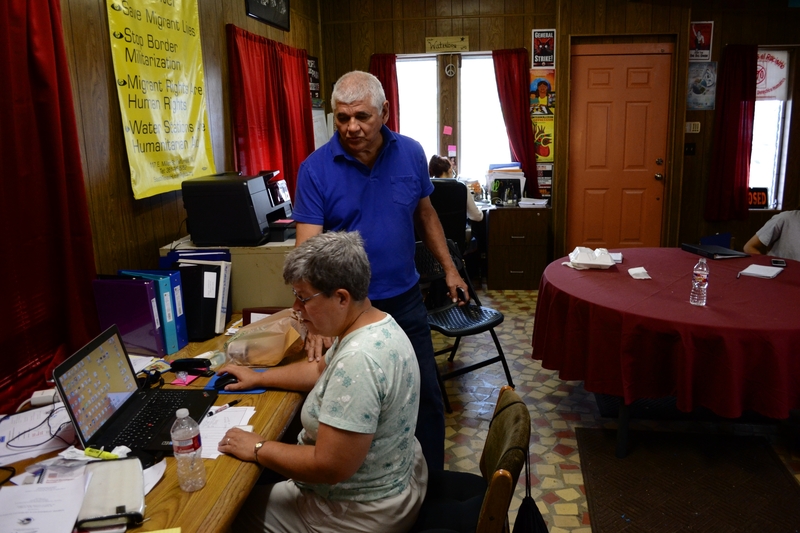 If you are interested in assisting the South Texas Human Rights Center, visit their website at http://southtexashumanrights.org/ and contact Eddie. I promise you will become inspired and proud in the process. The team at the STHRC is second to none, and has taught us new ways to engage and address this crisis. I am extremely thankful to have joined their team this week.